The Wee Unicorn is a member of my latest series called the Wee bits. 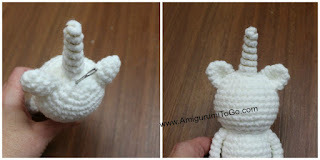 You can pick up the other animal pattern links in one post here they all have video tutorials except for this unicorn. I'm not sure when I will have video for this unicorn but I will update this page with the video link when I do. For now I have added in helpful video clips when I could for some of the unicorn parts and assembly. Scroll down this page for the Unicorn pattern. also find the option to leave a donation. Thank you so very much and enjoy! you can use safety eyes (7mm to 8mm), felt, buttons, yarn or paint eyes on. For the pot you will need a small amount of gold or yellow yarn. A small amount of glue and something to use as gold. I suggested different eye options in the supplies list above. Safety eyes are placed in between the 8th and 9th row. Yarn eyes are wrapped around the 8th row with 5 visible stitch holes between them. I added in a video clip in the assembly section below to help with the eye part and also other clips to help along the way in some of the other sections below. sl st next st and f/o leaving a tail for sewing. No need to stuff the horn. You can add a golden thread around the horn as I did or skip this part. To add it, bring the thread through the bottom edge going in from the inside to the outside. Now wrap the thread around each row (ring) wrapping tightly all the way to the top. Bring the thread down through the middle of the horn on the inside and knot it off with the thread at the bottom. Knot it tight then bring the thread back up through the middle again and back out at the top. Add 2 holding stitches over the thread on each side of the horn tip to keep the thread from unraveling at the top. Then go back in through the top, down through the horn and knot it once again at the bottom. Cut the thread tails and tuck them into the horn to hide them. Mane and Tail: You can use different colors or use just one color. For this one I used one color and also gold punch embroidery thread to add a bit of sparkle. You can modify this part to your liking and make chains or curly pieces or mix a bit of both. I'm keeping it easy for this pattern and included instructions for small bundles of yarn that can be sewn in very quickly but please feel free to mix it up. Wrap the yarn loosely around your hand 8 times then cut through the middle at the bottom. Now take a length of yarn the same length as your stretched out bundle and tie it off in the middle, tie this part very tight. Make 8 bundles, one for the tail and 7 for the mane. Don't make the bundle bigger than what I've instructed here as the strands will be easy to pull out when tied off. If you want a fuller mane it will be better to make more bundles. Pot of Gold: with yellow or gold yarn *optional ~ hold golden thread along with the yarn. This will add sparkle to your pot. sl st and f/o. Using the yarn tail, weave in and out through row 7, pull slightly, this will make row 7 close up a bit and give the pot some shape. knot off and hide yarn tail inside pot. Stuff pot with same color yarn you made the pot with. Stuff a bit more in the bottom to shape the pot. Row 3 has a ridge so be sure to use that for shaping as well. 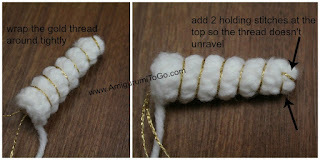 Pour in some glue on top of your yarn stuffing then add on top of that whatever you are using for your gold pieces. Let glue fully dry before touching the pot. 1) pin the ears in place and make sure you are happy with the placement. I found it was good to also pin the horn on at the same time so I knew it all looked good and I had the right spacing. Then take the horn off and sew the ears in. If you need help with this part, watch this video clip from another tutorial, they have the same amount of spacing between them that these should have as well. 2) sew the horn in place. I put my yarn needle into the magic ring that I started the head off with just to show you how close the horn is to that row. 3) sew the muzzle on. The top of the muzzle should be sitting just under the 8th row. If you have troubles with this part then watch this video clip from another tutorial. There's no need to stuff this muzzle, but you will pin it on and sew it on the same way as shown in the clip. 4) add in the eyes. Wrap yarn around the 8th row. Watch this video clip where the eyes are done the same way, wrapped around the same row with the same amount of space between them. Dot white paint on the black yarn to add a bit of life. Do this part after you sew the mane on so you can let the paint dry before touching the doll again. 5) Sew one of the yarn bundles to the back end of the unicorn where you think a tail should go. 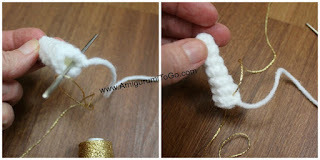 Use a yarn tail from the same length of yarn you used to tie your bundle off with. Once you sew it in and knot it off you can leave the yarn tail hanging with the rest of the yarn strands. Do this for all the mane bundles as well. 6) sew in the mane starting at the bottom. I started at the 9th row sewing 5 bundles, one after the other in a single line up the center. The the last 2 bundles go behind the ears as picture in the 2nd photo below. If you find the last 2 bundles didn't fill up the top of the head and it looks like it could use more mane just make another bundle and add it to the center right behind the horn and that should do it. 7) trim up the mane to desired length. Take your time doing this part, cut little bits at a time to be sure you're happy with the length when you're all done. Remember to post pictures of your wee Unicorn on my facebook page, Amigurumi Freely, I'd love to see! I got mine from Wal-Mart in the craft department, but Michaels, Pat Cataans, or any craft store would have them. I just made a unicorn, not sure how to post a pic though, but seeing as I'm new to crochet I'm very pleased, I found you on utube and found the link for here from there, I've made all the wee ones! Thank you for such an amazing unicorn pattern. I really enjoyed making it for my daughter. I hope you can have a pattern for a bigger unicorn. do you think that maybe doing a corkscrew type of mane would look better then the plain string yarn? i wouldnt mind doing the extra work.